Peritoneal dialysis (PD) refers to the treatment provided to patients suffering from severe kidney disorder. What is the Imbalance of Electrolytes? When your kidneys fail to perform their proper function, which is to purify the blood, you suffer from an imbalance of electrolytes. This includes having high levels of potassium, sodium and phosphorus, along with a low level of calcium in the body. When the sodium level of your body is high, you have a condition known as hypernatremia, during which you suffer from high blood pressure and difficulty in retaining fluids. An elevation in the potassium levels results in heart palpitations, weak muscles, uneven heartbeat, paralysis and fatigue. Increased levels of phosphorus, along with decreased levels of calcium, result in fractures, bone pain and even osteoporosis. Hence, to make sure that there is harmony among the balance of electrolytes in your body, you need to undergo dialysis when you suffer from kidney failure. In this treatment, the peritoneum in your abdomen is used as the membrane through which dissolved substance, including glucose, albumin, urea and electrolytes along with different fluids are swapped over from your blood. The fluid containing these substances is introduced into your abdomen via a tube attached to your abdomen permanently while you sleep, which is known as the Automatic Peritoneal Dialysis (APD) or Continuous Cycling Peritoneal Dialysis (CCPD). It is sometimes practiced several times during the day, which is why it is also referred to as Continuous Ambulatory Peritoneal Dialysis (CAPD). Peritoneal dialysis is a substitute for hemodialysis, but it is not commonly used. This is because this procedure is quite painful. However, this treatment can be performed at home without the patient needing to visit a proper hospital or healthcare facility. When and Why is PD Practiced? PD is practiced when the patient’s kidneys fail and they become unable to tolerate the fast exchanges of fluid that are practiced during hemodialysis. In hemodialysis, the patient’s blood is entered into a dialysis machine where it is filtered and then returned to his body. 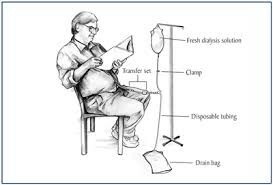 During hemodialysis, the patient cannot travel as often, which prevents them from performing routine chores. However, PD gives them this freedom and enables them to work easily. What Do You Need to Do Prior to Giving PD to Your Patient? To make sure that PD is carried out perfectly, it is best to educate the patient in detail about this process. If you are providing this treatment to your patient, you must guide them about all the steps involved in this process, the risks involved in it, its side effects, and the measures your patient should observe in order to take care of their condition. Moreover, you must examine their body and condition regularly to ensure that they are not experiencing any complication and are being treated properly. How is PD Carried Out? To give peritoneal dialysis to your patient, you first need to clean their abdomen to prepare for the surgery. During the surgery, one end of a catheter is inserted in your abdomen and the other end protrudes out from your skin. It is best to ask your patient to wait for about two weeks prior to giving them the PD treatment. This is so that the site of the catheter can heal properly. Prior to every infusion, you must clean the catheter and check the flow of the fluid into as well as out of your patient’s abdomen. After that, fluid containing all the necessary electrolytes and substances are transferred into the abdomen within 10 to 15 minutes of checking the flow and cleaning the catheter. This fluid is sterile and is known as dialysate. It stays inside the abdomen and all the waste substances enter the peritoneum from the blood vessels carrying these substances. A single session of this procedure takes around four to six hours. It is known as the “dwell time,” after which the fluid carrying all the waste is removed so that fresh and clean fluid can be added into the abdomen. The solution containing waste is drained into a sterile bag. The entire procedure, during which your abdomen is filled and drained, is known as an exchange process. You can use CAPD or CCPD, or even a combination of CAPD and CCPD, depending on the nature of your patient’s condition. During CAPD, the patient’s abdomen is filled with the dialysis fluid that is later drained. The fluid easily moves via the tube and in your abdomen due to the gravitational force. During CAPD, a patient normally needs three or four daily exchanges along with one exchange during the night, usually when they are sleeping. The patient can carry out their routine tasks with the dialysis fluid in his abdomen. On the other hand, if you are giving CCPD to your patient, the dialysis procedure is performed around three to five times when they are asleep. An automated cycler is used for filling their abdomen with the dialysis solution, and it is drained during the morning. This procedure provides your patient with relaxation during the daytime as they can conduct their routine activities without being connected to the cycler.